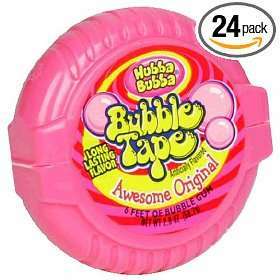 Bubble tape was the pretty much the best thing ever when I was a kid, since it meant you could stuff as much gum in your mouth as possible. Sure you could have done this with a bunch of sticks of normal gum, but it’s just not the same. I think it was supposed to be like a tape measure of gum, which makes sense because all the tape measures in the 90s were being used to make slap bracelets.